One in Christ: Marriage Renewal provides bishops, priests, deacons, and lay facilitators with an all-inclusive and comprehensive program to strengthen marriages so couples will come to a deeper understanding of their vocation in Christ. Rev. Thomas Aschenbrener presents both the sacramental theology and the practical “tools” of Christian Marriage to help couples reach an understanding of how marriage is an opportunity to assist the other in attaining Heaven and what that means for their lives together here on earth. How to embrace the unique call to authentic life and love in God's plan for the family. 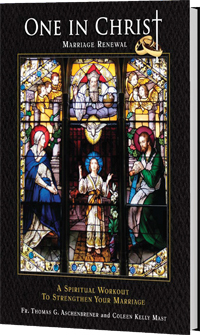 The program is designed to be flexible so it can be presented as a workshop at your local parish or diocese; alternatively, the materials can be purchased by individual couples to use as a self-study guide in the home.